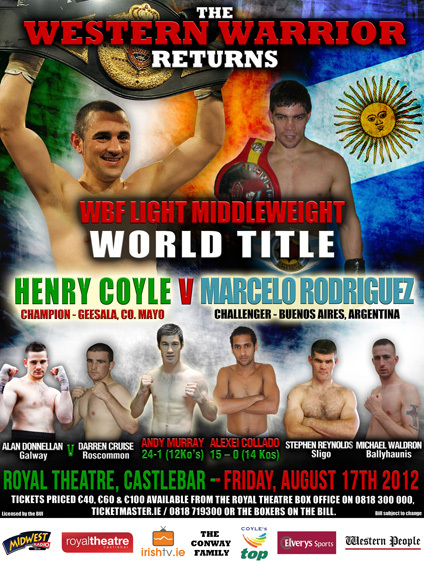 Henry “The Western Warrior” Coyle returns to the Royal Theatre, Castlebar on Friday, August 17th to make the first defence of his WBF Light Middleweight title against experienced Argentinean Marcelo Alejandro Rodriguez on another big night of professional boxing in County Mayo. Coyle won the title when he stopped Italy's Elio Cotena last year in front of a packed audience at the Royal Theatre which included Taoiseach Enda Kenny and Minister for Sport Michael Ring and he will be hoping to recreate the electric atmosphere from that night as he bids to repel his South American challenger. The card will also feature the return of Cavan's Andy Murray as he looks to get back to winning ways following his points defeat to European Champ Gavin Rees in Cardiff last year. Murray, like Coyle will face an Argentinian opponent in the shape of Sergio Omar Priotti. Cork based Cuban Alexei Collado will be out to impress as he aims to take a step closer to a world title with his impressive undefeated record currently standing at 15 wins, all but one of those wins coming via stoppage. Tickets for the August 17th event priced from €40, €60 and €100 are on sale from the Royal Theatre Box Office on 0818 300 000, Ticketmaster.ie / 0818 719300 and the boxers on the bill.